This Chocolate Pumpkin Mousse is so decadent, no one would ever guess it was made healthier. Since everyone is all about the pumpkin recipes this time of year, I created another one for you. Chocolate and pumpkin make the best combination ever. All you need is 4 simple ingredients and just a few minutes. I just love recipes with small ingredient lists. 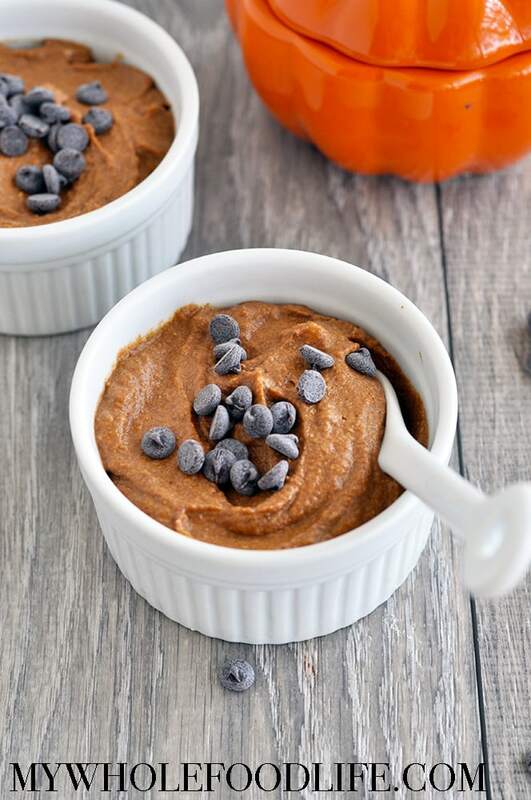 This healthy pumpkin mousse is vegan, gluten free and paleo. There is very little added sugar. I topped mine with chocolate chips, but you can definitely eat it plain too. This would also be a great frosting recipe. Want to make this recipe? Watch the video below! For more videos you can subscribe to my You Tube Channel. Looking for more pumpkin recipes? I’ve got you covered. Open your refrigerated can of coconut milk and scoop the solid, fatty part into your mixing bowl . You can save the leftover water for smoothies. Add the remaining ingredients to the mixing bowl. Using the whipping attachment on your mixer , whip into a mousse. Spoon the mousse into small bowls and serve immediately. Any leftovers can be refrigerated for up to 2 weeks. Ran to the kitchen and made this as soon as I saw it! Delicious!!! I don't have an electric mixer, would you recommend using a food processor or just whisking/beating by hand? Thanks! You might be able to whisk by hand. Oh My Goodness! This looks so amazing and I love that there are only 4 ingredients! Just got a pumpkin. Now I know what I'm doing with it! FYI, Youtuber Niomi Smart is passing this recipe off as hers. 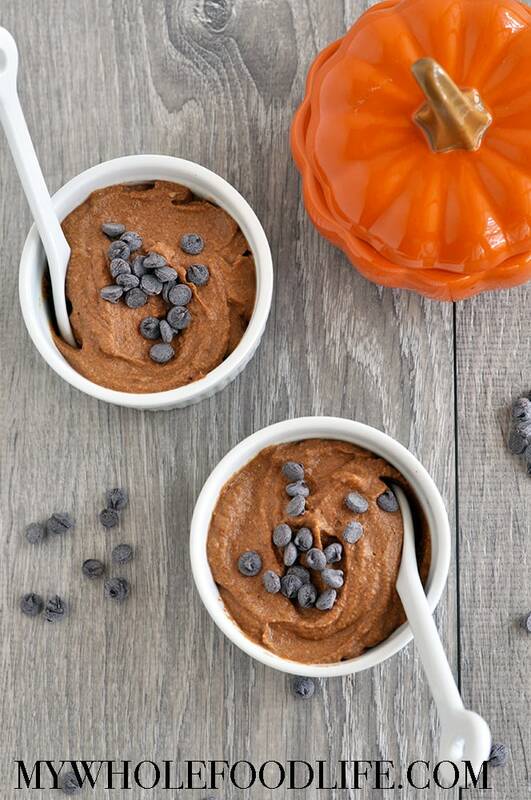 http://www.niomismart.com/2015/10/healthy-pumpkin-and-chocolate-mousse.html?m=1 I commented that, although I like her instructional videos, I wish she would give credit. She is feigning innocence saying that she developed this recipe a few weeks ago. Very interesting and unfortunate timing, if she did. Same recipe...she just added a couple additional spices. Unlike the recipes you provided, Niomi's was exactly the same, with just two additional spices, and published only weeks after Melissa's blog. Intellectual property is important for those who base their livelihoods on it...all I did was bring it to Melissa's attention. I would argue that they aren't exactly the same and honestly, saying that all she did was add a few spices... well, you could say (not that I am, mind you) that Melissa took one of the many recipes available online and removed a few spices. I don't know either woman and don't believe either of them 'stole' this recipe (and intellectual property and recipes... that's impossible to prove, as most recipes are a variation of something that's been done before); the simplest answer to your 'why now?' speculation would probably be that it's Halloween, and everyone seems to be baking with pumpkin and chocolate. Full fat coconut milk? Or is light okay in this recipe? Sounds wonderful, thank you for sharing! Hi Amy, Unfortunately, low fat coconut milk will not work in this particular recipe. It needs the fat to solidify and make cream. This looks awesome. I'm a low carb gal. Wondering if think Stevia could replace the syrup?